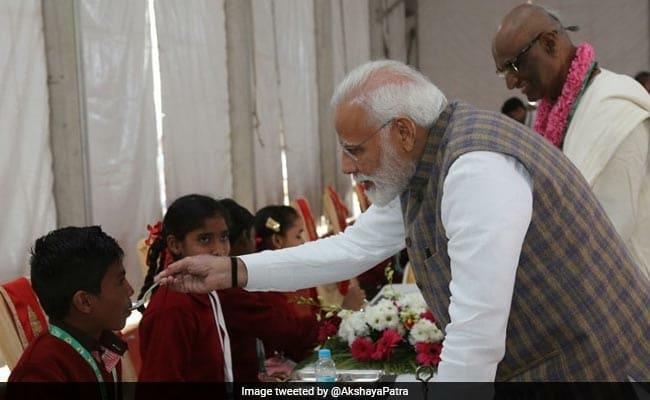 Vrindavan, Feb 11 : Prime Minister Narendra Modi on Monday served food to underprivileged schoolchildren in this sacred city, marking the three billionth meal offered by NGO Akshaya Patra. BJP's Mathura MP Hema Malini, ministers of Uttar Pradesh government, including Anupma Jaiswal, Minister of State (Independent charge) for basic education, child development and nutrition, local MLAs and Mukesh Arya Bandhu, Mayor - Mathura-Vrindavan Nagar Nigam were also present on the occasion. Addressing the commemoration, the Premier said, "I am happy that Akshaya Patra which started its mid-day meal programme in 2000 serving 1,500 school children has reached new milestone today serving over 1.76 million children from 14,702 schools across 12 states in India." "The first meal was served during late PM Atal Bihari Vajpayee's regime and today I am delighted to serve three billionth meal which will add another feather in the NGO's cap", added Mr Modi. Uttar Pradesh Chief Minister Yogi Adityanath said, "Around 1 crore 77 lakh school children are being served mid-day meal in the most populous state Uttar Pradesh. I believe that the nutritious food being served to the children everyday is an exemplary task initiated by Akshay Patra". In 2012, Akshaya Patra reached its first major milestone of serving one billion cumulative meals since the inception of the programme in 2000, the Foundation Akshay Patra claimed. "By 2016, the organisation had already served cumulative two billion meals. This milestone was commemorated in the presence of Pranab Mukherjee, the then President, on August 27 that year in Bengaluru," the NGO said, adding that they are eyeing to serve meals to 5 million children every school by 2025. As the implementing partner of the Mid-Day Meal Programme, Akshaya Patra has received the support and encouragement of the Ministry of Human Resource Development and various state governments all along its journey. Today, Akshaya Patra is the world's largest (not-for-profit run) mid-day meal programme serving wholesome food every school day to over 1.76 million children from 14,702 schools across 12 states in India," the Foundation said.